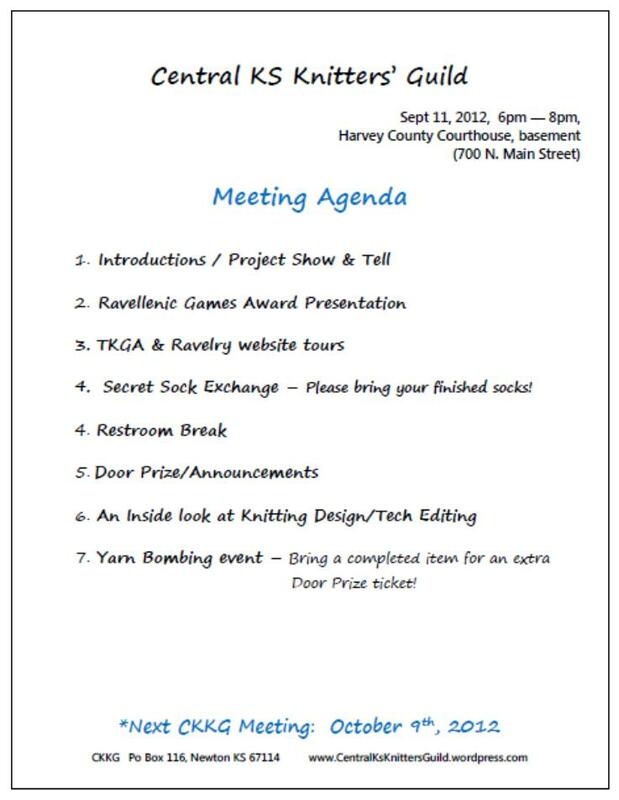 Grab your knitting and a friend and join us for the September Knitting Guild meeting! Tuesday, Sept 11th from 6-8pm at the Harvey County Courthouse (Newton, Main & 7th streets). *Check our Ravelry page for more information and carpool details. We have several new members from the Wichita area! *We will be collecting items for the WSU Yarn Bombing! Get an extra door prize ticket for bringing a completed item! Secret Sock Knit-A-Long Exchange: If you have been participating in the Secret Sock KAL, please bring your finished pair of socks for your Sock Buddy! If you already received your socks, please bring them along for a photo (If you can’t make the meeting, we would love to see your socks. Email us!). Next Next post: Yarn Bombing Update!